Luigi Gea and Tony Shelbourne, New Zealand Tree Grower November 2006. 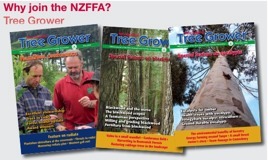 There is interest among New Zealands small growers in growing eucalypts for sawn timber. Recent research funded by FRST has concentrated on species introduction and testing of a group of naturally durable stringybarks along with a few other species with good reputations for low growth stresses, good sawn timber characteristics and lack of disease and insect problems. These include E. pilularis and E. muelleriana, species well-known for good sawing and sawn timber characteristics of appearance-grade lumber. Recent simulation studies have shown that it is possible to get good genetic gains from small scale breeding programmes on a single generation basis. This approach is well suited to progressing the genetic improvement of promising species of which there are some genetic resources, but where there is low immediate demand for seed. Eucalypt species trials have been planted in North and South Island plantation forests since 1970 by the New Zealand Forest Research Institute – now Scion, and by New Zealand Forest Products Forests Ltd – now Carter Holt Harvey Forests Ltd. 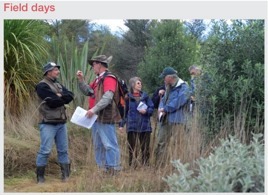 The National Plant Materials Centre at Aokautere, Palmerston North also planted a number of eucalypt species trials to test species for their potential to stabilise erodable land. Two trials were planted near Masterton in 1979, at Kahuiti station and at Pakaraka. The Kahuiti trial, which included a total of 104 seedlots, representing 49 eucalypt species was assessed by Ensis in 2001. The Kahuiti site is 28 km east of Masterton at an altitude of 150 to 180 metres on a steeply sloping site of silt and clay loam over mudstone. The site is typical of Wairarapa hill country that suffered severe earthflows during a wet winter in 1977. The mean annual rainfall is 1000 mm. The total number of trees planted was 16 per provenance and 32 of single provenance species. The trial was not thinned, fortunately as it turned out, as natural attrition reduced survival to 66% by age 12 years and 43% by age 22. Unfortunately the better grown Pakaraka trial had been thinned a second time in 2000, which reduced tree numbers per species so much that assessment was not worthwhile. Apart from 10 species, which had six or less survivors, the average number of surviving trees per species was 23. The 14 species which grew best in terms of diameter at breast height (DBH) out of the total of 37 species with nine or more trees surviving are listed in the table in descending order. E. cordata, an insignificant gum from south east Tasmania, grew as well as the better ashes while the other gums, including E. nitens, ranked at the lower end of the best 14. Although only nine E globoidea and ten E. muelleriana trees survived, they had surprisingly outgrown all other species. Other species of interest for sawn timber that survived poorly at Kahuiti were E. cladocalyx and Corymbia maculata, spotted gum, which ranked in the middle of the range. Amongst the best grown group, E. delegatensis, E. fastigata, E. obliqua and E. regnans had the best bole straightness and malformation scores of the ashes. All of the ashes had better form than the selected members of other groups except E. nitens. Stringybarks E. globoidea and E. muelleriana were down graded by their tendency to fork. The number of potential sawlogs was by far the highest for E. delegatensis, followed by E. regnans, E. obliqua, E. nitens and E. fastigata. From experience with other species trials in the central North Island and in Northland there are many changes that occur in relative species performance up to and beyond age 12 years. These are due to adaptive responses to environmental factors, to disease and to insect attack. The results above are imprecise, particularly for those species with fewer trees assessed. However they have the merit of being from trees at age 22 years, which represents about two thirds or more of rotation age for sawlogs on this site. The results should characterise the species for their long term potential performance, at this relatively low altitude site in the Wairarapa. Between 1978 and 1986 the National Plants Materials Centre planted trials with similar objectives and similar design at a further 13 sites in Hawke’s Bay and the Wairarapa. These were distributed from near Wairoa in northern Hawke’s Bay to Longbush and Martinborough in the south Wairarapa. In altitude, they ranged from 70 metres at Waimarama to 300 metres at Pukeatua, east of Martinborough. However they were mainly between 100 metres and 200 metres, with annual rainfalls varying from 850 mm at Havelock North to 1400 mm east of Wairoa. A total of six ashes, five peppermints, 11 gums plus an E. botryoides x saligna hybrid seedlot and E. robusta, were variously planted at different sites. A group of nine species was included at most of the sites. They were ranked for adjusted mean diameter at breast height at age 12 years over 10 sites. A further trial was planted at Te Whiti, close to the Pakaraka site near Masterton, which included 35 species, planted in three replications of 12-tree plots. Prior to assessment at age 15 years it was thinned to leave only two trees per plot and six trees per species. The 12 species with largest mean diameter at breast height included the stringybark, E. muelleriana, the ashes E. fastigata. E. fraxinoides and E. obliqua, the peppermints E. coccifera, E. pulchella and E. tenuiramus, and the gums E. nitens, E. ovata and E. perriniana. Although the number of trees per species was too small for firm conclusions, the same group of species are performing well here as at Kahuiti. Growth and form, and therefore log quality, are important to the grower. But for sawn timber the sawing behaviour and the characteristics of the dried product are important in determining value. Indications are that with a few exceptions, the fast grown, well formed ashes and E. nitens are subject to growth stresses, causing sawing problems and internal checking on drying. These both seriously down grade their value for solid wood products except veneers. E. fastigata is a widely adapted and robust contender and the well grown stringybark species, E. muelleriana and E. globoidea show good prospects for sawn timber if form is improved or managed. The search for eucalypt species in New Zealand that are fast grown, widely adapted, well formed and free of serious pest and disease problems is a demanding one and is made even more so when solid wood use requirements are included. There is growing circumstantial evidence that the stringybarks, a distinctive group of the subgenus Eucalyptus, which have rough, persistent and long-fibred bark, contain several species which are well adapted and have excellent sawing and solid wood properties, including natural durability. However early assessment of plots indicates that site specialisation is as strong as any of the other eucalypt species and careful siting is needed.